The trial follows the top of the rocky ridge and then crosses into the forest where it climbs to the flat area in the center of the picture. Click the image to see an enlargement. From Cave Junction, drive 9.8 miles on Highway 46, the Oregon Caves Highway and turn left on Little Grayback Road, a gravel surfaced Forest Service road, and follow this for 5.9 miles to the top of the ridge. At the top of the ridge, the vegetation opens into a sparse stand of pine trees with a two track road going off to the left. The road gets rough and high clearance is needed to drive the short distance to the trailhead. If you do not have high clearance, park at the intersection shown in the picture above and walk from there. The road enters a large open area then reenters the forest on the other side where it climbs for a short distance and ends at a turn around point. As you approach the turn around point, look to the left for the trail. There is no sign at the trailhead. IMPORTANT NOTE: There are quite a few nails on the turnaround area at the end of the two-track road, probably the result of people camping there and burning palettes. If you have a high clearance vehicle suitable for driving up the two-track road, it is recommended that you park in the large open area near the end of the two track road and walk from there to avoid the risk of puncturing your tires. 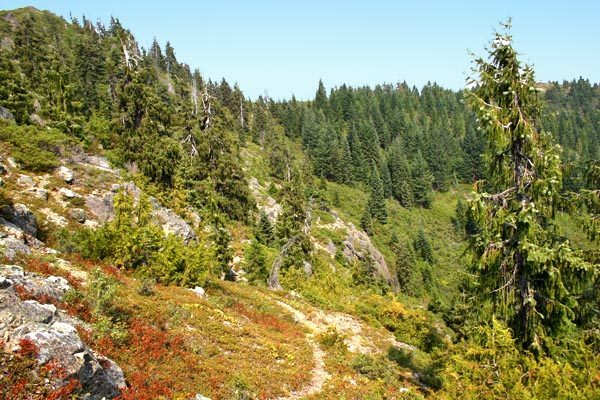 The trail drops down through a heavily wooded ridge to a saddle before beginning to climb toward Little Grayback Peak. There are many Brewers spruce along the trail, one of the endemic trees that grow only in this region. Brewer spruce, also known as the weeping spruce, is easy to identify because of the distinctive galls that grow on the tips of the branches. Much of the trail follows the top of a rocky ridge and is generally easy to follow but at one point it takes a sharp right turn and cuts across the ridge where it continues through the forest for the final climb to the lake. This crossing is not well marked and there is no distinctive trail that makes it obvious that this is the way you need to go. If you are not watching for it, you are likely to miss it and find yourself in thick brush wondering what happened to the trail. 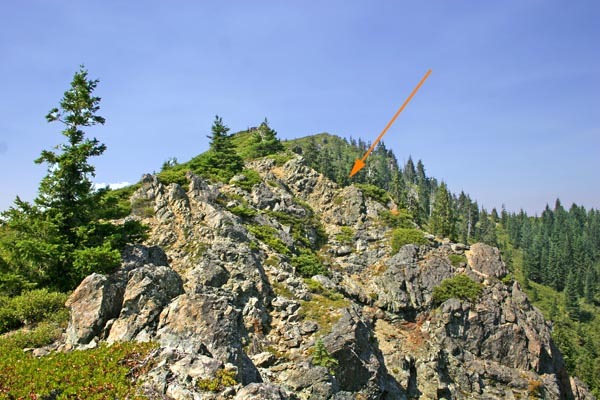 The orange arrow shows the location of the trail where it makes a sharp turn to the right and crosses the rocky ridge. 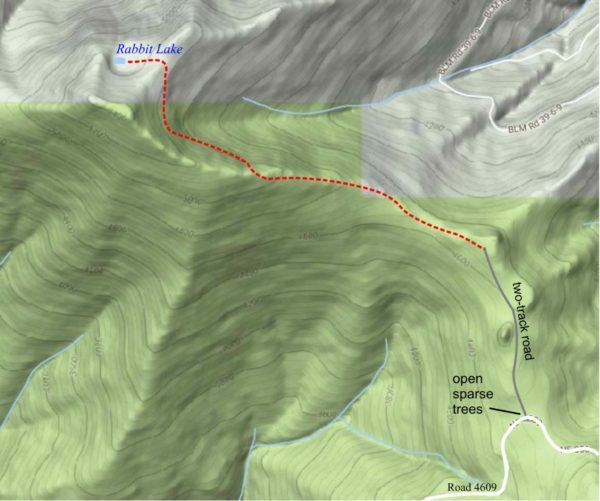 After crossing the rocky ridge, the Rabbit Lake trail will look like what is seen in the lower center of this photo.